I totally woulda given it to the Mad Men bloody John Deere Peep diorama (#21), though! Come on! BLOODY PEEPS! (My personal runners-up: Balloon Peep (#24), with a pink and blue peep holding a giant press conference in front of a house with a crinkled silver cupcake wrapper on the roof and a terrified little blue peep hiding in the attic; and the stark tribute to Hitchcock’s The Birds, starring a smoking Bunny Hedren peep surrounded by ominous Peep chicks (#26). JEEENYUS. 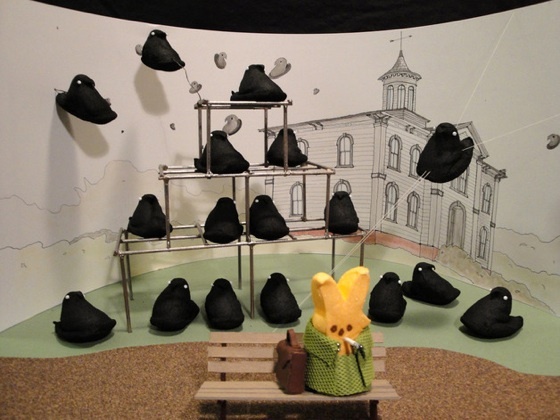 You know, every single year I say I’m gonna have my kids do a version of Peeps for Passover and I never do. I’m a failure as a parent.